Here is a walk for the Christmas holidays. It has everything – pleasant countryside, woodland and seashore and for the energetic one of the best views in the north of England. Map: OS OL7 The English Lakes South Eastern Section. 1. Just beyond the Cumbria sign turn right onto a footpath leading into Holgates Holiday Caravan and Camping Park. downhill through trees to exit the site into a broad expanse of pastures. Keep ahead to a metal gate and continue on a broad path until you reach a lane. and then a (Holgates) caravan site. Keep ahead on the main drive as it descends gently to a metal gate. Beyond this keep ahead on a gravelly track to arrive at a second metal gate leading onto the shore of Morecambe Bay. How you walk the next mile will depend whether the tide is in or out. If the tide is out you will be able to walk on the sand. If the tide is in cross the stony beach and then pick up a narrow path that hugs the coastline. If in any doubt about the state of the tide keep to this path - the tide comes in with notorious rapidity. Follow the path to a headland in a westerly direction and keep on it when it swings north. On the opposite shore Grange-over-Sands will be easily spotted just two miles from this point. passes through another caravan site to join a drive. where the shoreline path comes in from the left. Continue on the road which turns to the right on the far side of the bay. until you reach a wall. Here turn left and follow the wall uphill to arrive at a junction of tracks. 3. Another choice to be made - one that depends entirely on the weather. 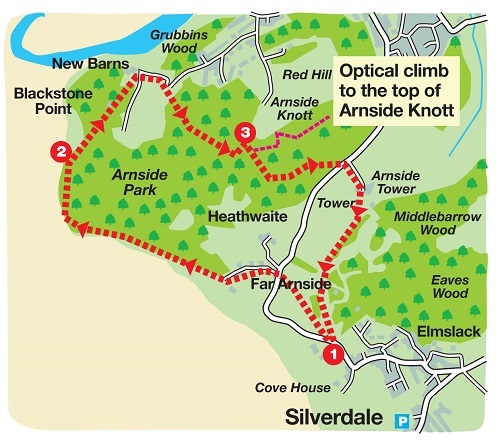 If views are restricted turn right onto a bridleway which crosses the shoulder of Arnside Knott and then descends to a lane opposite Arnside Tower. However if visibility is good do not deny yourself one of the great viewpoints of the north of England. The trig point is to the right of the path as it reaches the summit plateau. However the best views can be seen from the purpose built viewfinder which is located on the main path. Now re trace your steps to the bridleway and follow it down to the road. Cross to the drive of Arnside Tower Farm. the right of way continues up to the Tower. Cross a wall to join a grassy track and then turn left through trees to return to Holgates Silverdale Holiday Park. POI Holgates manages six caravan/camping sites all of which are in the North Lancashire/Cumbria area. As you pass through the Silverdale site you may find it hard to believe that there are some 400 units on this site such is the attention given to landscaping. The company's commitment to sustainable tourism was recognised earlier this year when it won the prestigious David Bellamy Conservation Award.